Account manager resume form title page close-up with blue tint. Photo courtesy of Shutterstock. When do you refresh your resume? Do you do it when you feel uncertain about your current job or when your current employer appears to be unhappy? How about whenever you receive a new responsibility or a new position within your current company? What should you do? Most individuals in the current economy recognize that employment, even long-term employment, is not guaranteed. Companies go bankrupt, are purchased, move offshore or downsize. Considering all the vagaries, it’s an excellent idea to keep your resume up-to-date. Avoid doing it when you’re worried about your current job or when you’re ready to start looking for a new one. The stress you’re under at such a time can cause you to leave off your best work – either because you’ve forgotten it or you are so depressed it doesn’t seem to make a difference. Most companies review performances of employees on a yearly basis. This time can be a good time to sit down and put your successes on your resume. Perhaps when you’ve completed or supervised a major project successfully would be a good time. Attempt to deal with the resume from a position of strength and hope, so you have that feeling as you construct the details. 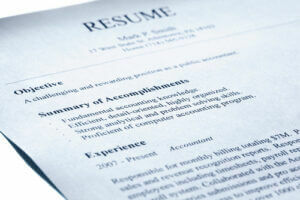 Should You Post Your Updated Resume Online? Advisors are of two minds about this. One school points out those recruiters investigate sites such as LinkedIn to look for individuals that fit their criteria. New-position offers can result from this type of posting. Another school, however, points out that your current employer and/or friends may assume that you’re seeking a new position for some reason or other. Assess your employer carefully, but recognize that a certain amount of openness about the intent to keep credentials current may help. A resume is a history of your work life relevant to the job or position you seek as the culmination of your life’s work. Most people work until retirement and even past, considering how healthy the American workforce is in general. Keep a resume up-to-date to facilitate that ability to continue to work. Probably in the years since Spencer Johnson’s bestselling book “Who Moved My Cheese, An Amazing Way to Deal with Change in Your Work and in Your Life” published in 1998, most of us have become aware that keeping credentials, resumes, and even lives ready for the changes that inevitably occur is necessary. His parable about the mice and the little people reminds us of that. Inactivity, complacency and a sense of entitlement lead to difficulties. Being ready for change and accepting it as part of life can help all of us lead a happier, more fulfilled life. One of the ways of doing this is to keep resumes, credentials and even our savings ready for that inevitable change. Stay trim, lean and be prepared for change to be more successful in your work life. Update that resume now! Bio: Veselina Dzhingarova has a master degree in Translation and Intercultural Communication Studies. She is experienced in teambuilding in multicultural environment. Blogging about the important things from everyday life is her passion along with travelling around the world.